Looking for solid hardwood, custom-made Goshen Amish Furniture? The closest and best source is just a short drive away. Weaver Furniture Sales in Shipshewana, Indiana. Take E LINCOLN AVE/IN-4. Continue to follow IN-4 for 6.9 miles. Then, IN-4 becomes IN-13 for .5 miles. Stay STRAIGHT to go onto COUNTY ROAD 32 for 2 miles. Turn LEFT onto E COUNTY LINE RD. Go .5 miles. Then, turn RIGHT onto W 200 S. Go about 4 miles on W 200 S.
Turn LEFT onto IN-5. Drive about 2.6 miles. Turn RIGHT onto W 075 N.
In about .1 miles, you’ll see Weaver Furniture Sales on the RIGHT. Since 1989, Weaver Furniture Sales has been offering a full line of custom-built Goshen Amish Furniture. This means you can find items for every room in your home. In fact, you can order individual pieces. Or, you may wish to select complete sets. Such as bedroom, dining room or living room sets. Also, we offer entertainment furniture, office and outdoor furniture. What’s more, you can get all styles of furniture. Including Mission, Shaker, Modern – and more. So browse our online furniture catalog. Because it showcases about to 5,000 products, and you can order online. We invite you to visit our 25,000 square foot showroom in picturesque Shipshewana. Right in the heart of Amish Country. Also, check out our beautiful, top-quality furniture for yourself. In fact, you can buy items you see on the showroom floor. Or, you can custom order. Don’t have a truck? No problem. Because we deliver. Also, we offer financing. 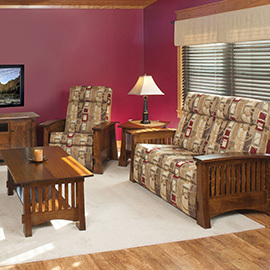 Browse our Amish Furniture and we hope that you pay us a visit from Middlebury, Goshen or Elkhart. Bring this special offer information with you to save!